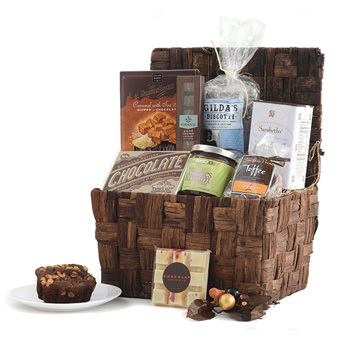 From the East coast to the west, this abundant basket highlights the very best of artisanal American-made chocolate. Sarabeth's is a New York City legend, and her drinking chocolate rivals any found in Europe. Thick and creamy, it's a perfect way to warm a chilly day. A decadent, handcrafted Avant-Garde bar from Chocolat Moderne in New York City's Meatpacking District will have you dreaming in flavors of white chocolate, passion fruit caramel and cardamom. Cookies and Cream spread from Brooklyn's Tumbador Chocolates is a spreadable version of an Oreo Cookie - a delicious tread slathered on a crepe or eaten with a spoon! 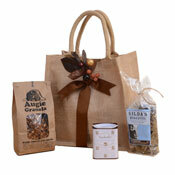 And Gilda's Chocolate Espresso biscotti is handmade in Pennsylvania to traditional Italian methods. Further down the coast in North Carolina comes a whisper thin cookie from The Salem Baking Company. Blended with some of the world's most cherished artisan chocolate, this delicate wafer is a perfect symphony of chocolate flavor. The south is well represented with premium American craft chocolate from Nashville's Olive and Sinclair and Southern Pecan Toffee from Lambrecht Gourmet, handmade in Heber Springs, Arkansas. Completing this beautiful chocolate gift are award-winning Gray Salt Caramels from Seattle's Fran's Chocolates. 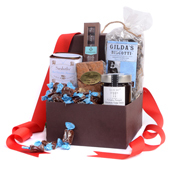 This glorious celebration of American chocolate will arrive nestled in a rich chocolate-colored basket with a flip lid, and tied with a beautiful ribbon and decorative pick. The Salem Baking Co.-Chocolate Dipped Caramel with Sea Salt Moravian Cookies, 5 oz. Lambrecht Gourmet Southern Pecan Toffee, 3 oz. Sarabeth's Hot Chocolate , 16 oz. This item is sensitive to heat. To protect your order in warm weather—typically April 15 through October 15--or when shipping to a hot destination, 2-day air shipping is required. When estimating days in transit, please exclude shipping date and weekend days. Heat sensitive orders placed after 12:00 pm CST on Wednesday will be held for shipment until the following Monday.